WyeSoft LockLock is a simple utility that can be used to lock Caps Lock, Num Lock and/or Scroll Lock in a particular state (permanently on or permanently off). This is useful if you do not use one or more of the lock keys, but regularly hit them by mistake, or if you use them for other functions, such as a push-to-talk key in a game or voice communication client. To install, open the ZIP file and then open the "setup.exe" file inside it. While installing, if you are asked whether to keep or replace existing files, choose to keep them. 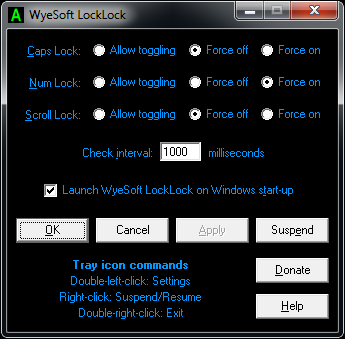 WyeSoft LockLock v1.00 (freeware) --------------------------------- http://www.wyesoft.com/ ----------------------- Copyright © 2014 WyeSoft. All rights reserved. ----------------------------------------------- Designed and created by Matthew A. Wood --------------------------------------- Released 4 November 2014 ------------------------ Disclaimer ---------- Download and use our software and webtools at your own discretion. WyeSoft cannot be held liable for any harm resulting from the use of our software or webtools or from the viewing of our website content. Introduction ------------ WyeSoft LockLock is a simple utility that can be used to lock Caps Lock, Num Lock and/or Scroll Lock in a particular state (permanently on or permanently off). This is useful if you do not use one or more of the lock keys, but regularly hit them by mistake, or if you use them for other functions, such as a push-to-talk key in a game or voice communication client. Tray icon commands ------------------ Double-left-click: Settings Right-click: Suspend/Resume Double-right-click: Exit Settings -------- You can set the desired state for each lock key (Caps Lock, Num Lock and Scroll Lock) individually. "Force on" and "Force off" cause the lock key to automatically switch back to the chosen state whenever it is toggled. "Allow toggle" causes the key to act the way it normally does, toggling on and off the lock whenever you press it. "Check interval" is the amount of time, in milliseconds (thousandths of a second), that you want LockLock to wait between each check/reset of the lock keys' states. Setting the interval too low may use a lot of system resources and cause other applications to run slowly. The default, 1000 ms, is suitable for most situations. You can configure LockLock to run whenever your computer boots up by ticking the "Launch WyeSoft LockLock on Windows start-up" box. Compatibility ------------- Unfortunately, WyeSoft LockLock is not fully compatible with all software. This is because a simulated keystroke of the lock key is required to change its state. Some games and programs, therefore, will register this simulated keystroke as a real keystroke, and respond as they would if you had pressed the key twice.